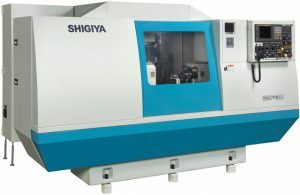 The GSF-30 CVT grinder is the grinder of choice for turning around highly complex continually variable transmission (CVT) shafts with micron-close tolerances and superfine finishes to exact specifications. The GSF-30 is designed for CVT shaft journal and face grinding within one chucking. It optimizes CBN grinding wheel technology with programmable wheelhead for high-speed, accurate plunge, traverse and contour grinding.